There’s a story in this week’s West Sussex County Times regarding the removal of bicycles chained to the railings outside the front of Horsham station. 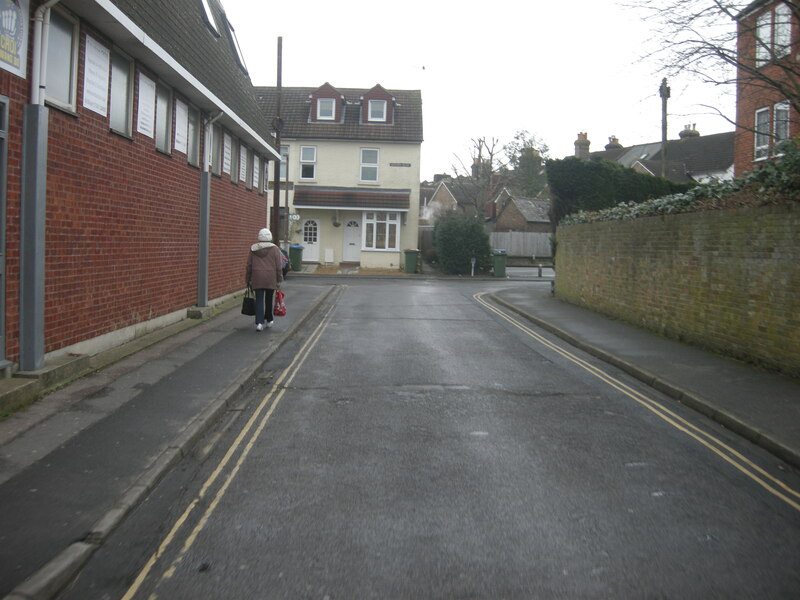 It seems one commuter returned to Horsham to find that his bicycle had been removed and put into storage. 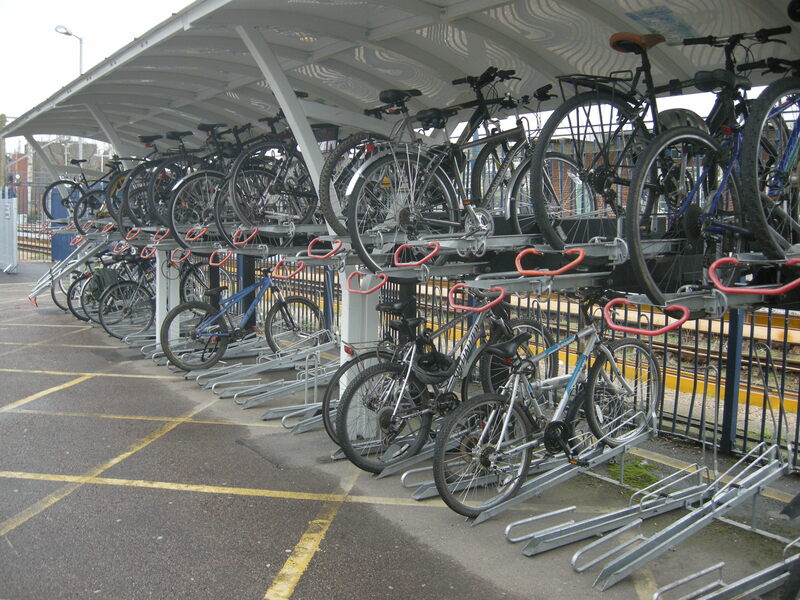 It must be said that Southern trains (and West Sussex County Council) have done a pretty good job at vastly increasing the number of cycle parking spaces at the station; there are now getting on for 150 spaces in total, when just a few years ago there were only about 20 (and none at the rear of the station). I wrote about these improvements a year or so ago. However, I think there’s a problem with where these parking spots are. There are 112 spots at the rear of the station, which is excellent. Last summer (when people are more likely to commute by bike) they were mostly full. 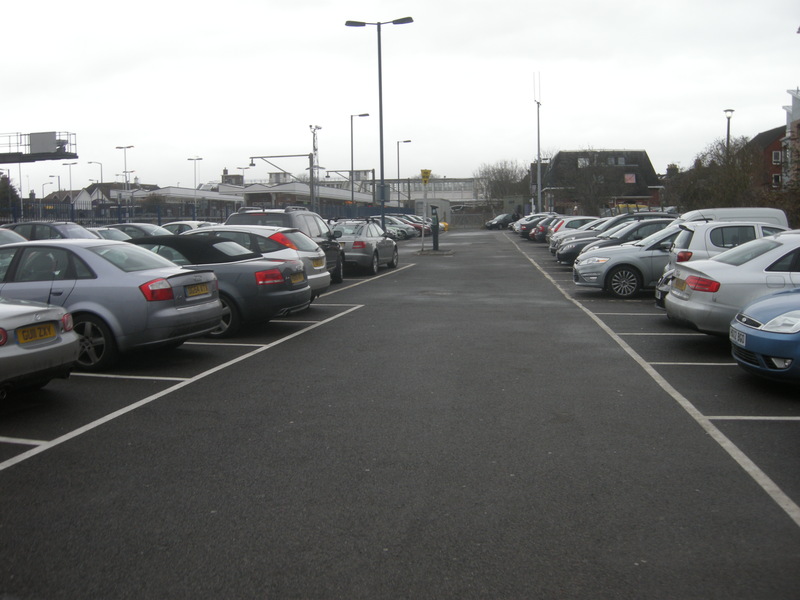 By contrast, there are just 24 spaces at the front of the station. Demand for these spots is high, as you can see. Bikes are chained to the frame of the stand, as well as to nearby furniture. Demand outstripping supply on this side of the station is not surprising, because the station is located pretty much bang in the middle of the town. You would consequently expect just as many people to arrive by bike at this main western entrance as you would on the eastern side, if not more, given that there are shops, cafes and more services in general at the main entrance. 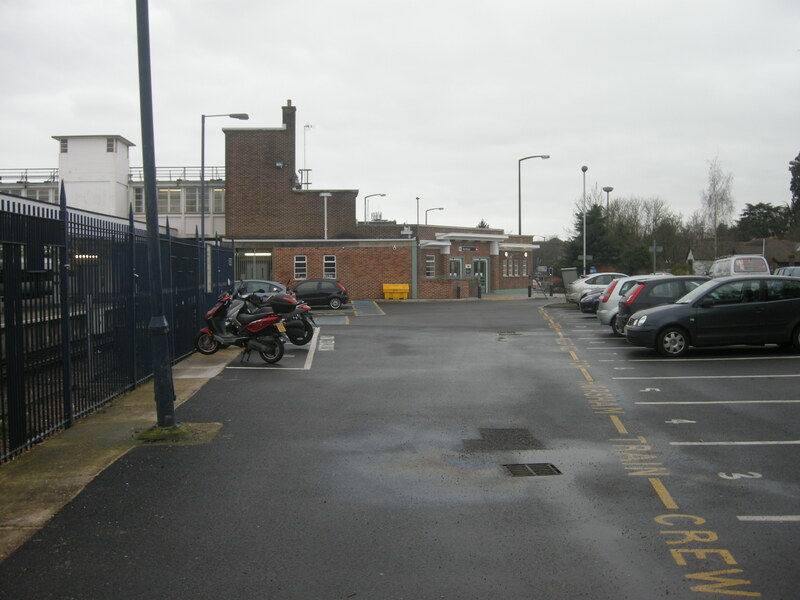 Indeed, the more generous parking at the rear of the station is only about half full, on this cold and damp winter’s day. 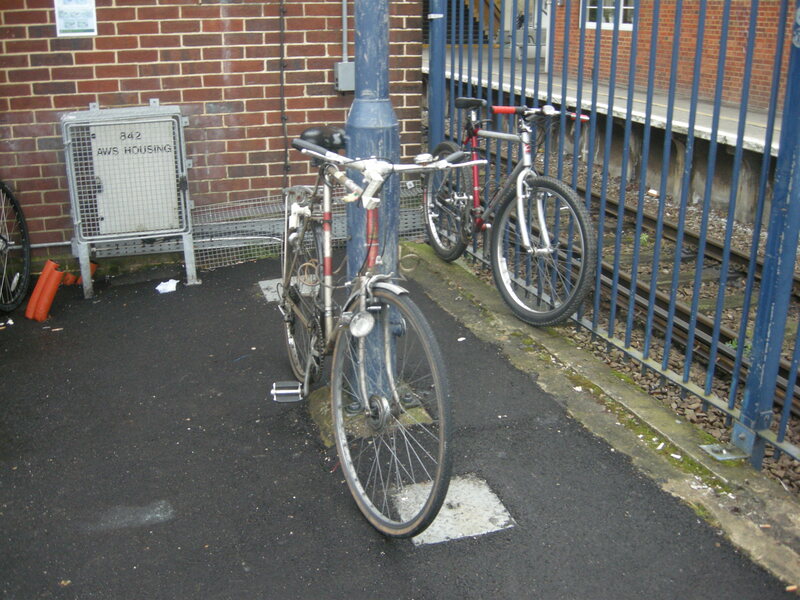 A Southern spokesman said: ‘There is no reason for people to chain their bike to railings at Horsham station. 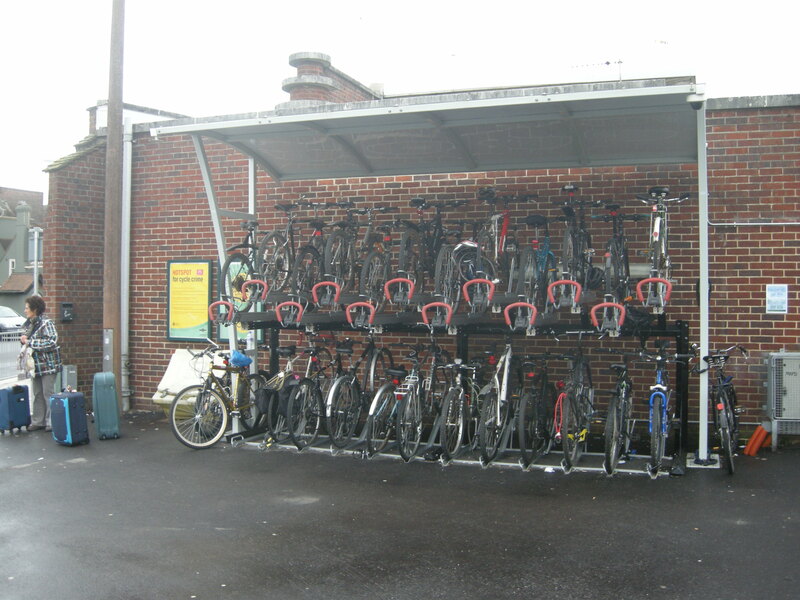 There is ample room for cycles at the rear of the station if the front is full. Access to the rear is by means of the subway and it takes just a couple of minutes to go from the front to the rear. 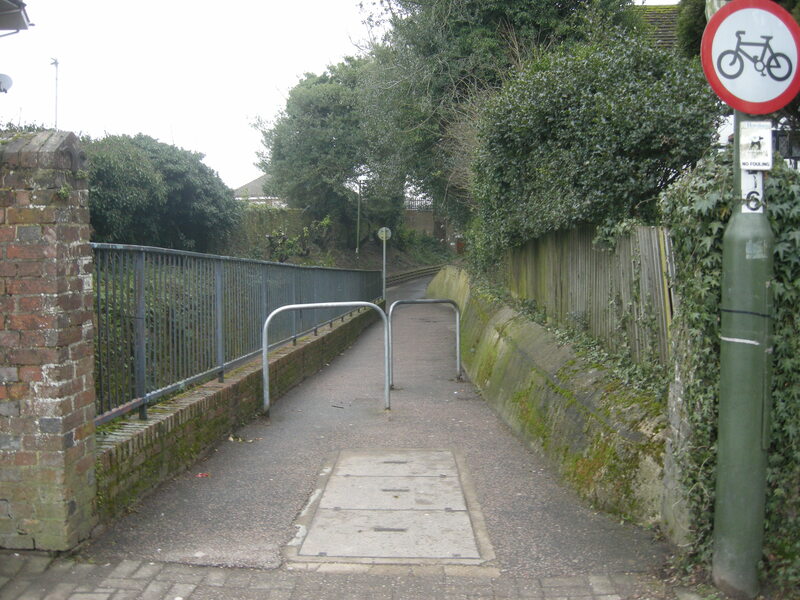 “We give plenty of warning to cyclists by means of posters and signage that cycles chained to the railings will be removed. That’s not particularly helpful, I’m afraid. 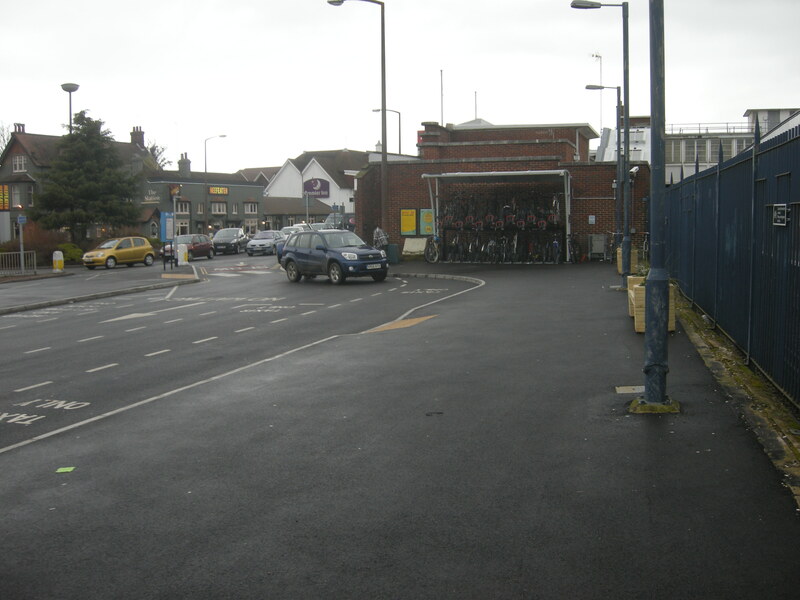 As it happens, it’s more convenient for me to use the rear of the station, but if I did arrive at the front, it would be slightly annoying to have to budget at least five minutes more time in the expectation that I might not find a space, and have to make my way to the rear of the station. It’s not just a ‘couple of minutes’. 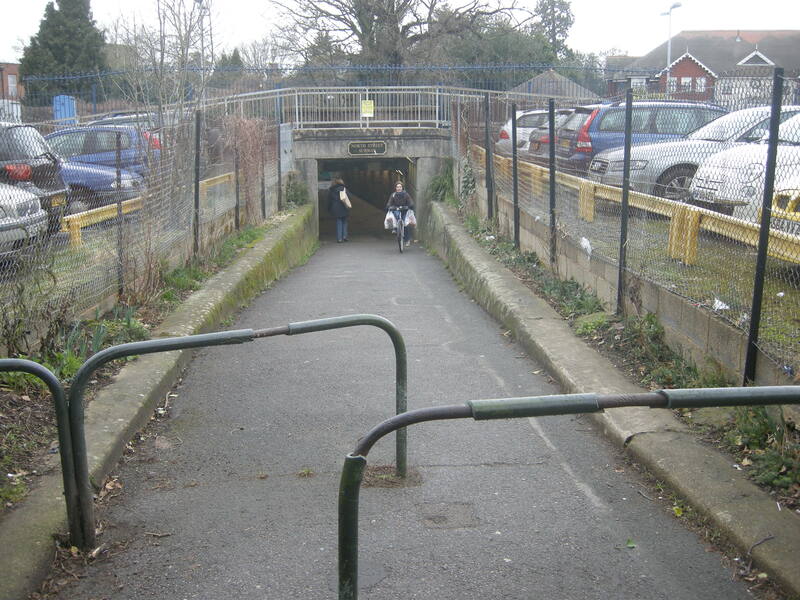 You have to make your way to a subway some 100 metres down the road, then walk through it (because cycling isn’t allowed). Then across the large car park. 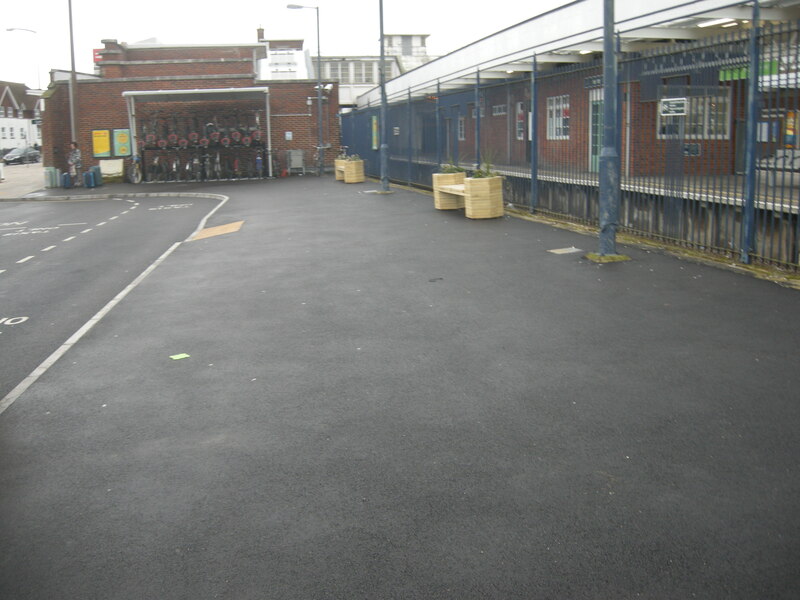 Before finally arriving at the rear of the station. Not the biggest problem in the world, certainly, but inconvenient to have to make this extra journey every day simply because the balance of parking at the station is wrong; it should be more evenly distributed between the front and the rear. 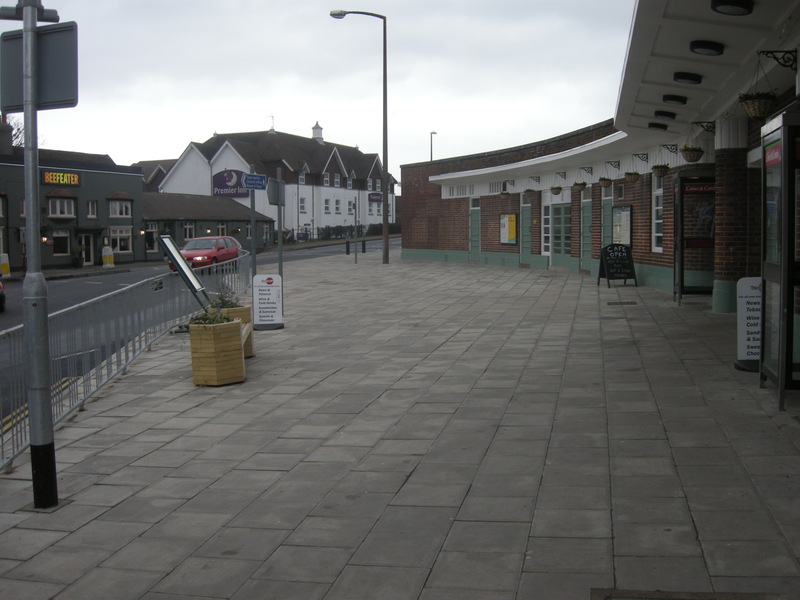 there is nowhere at the front of the station for additional cycle racks. No location that would not compromise the station evacuation point. 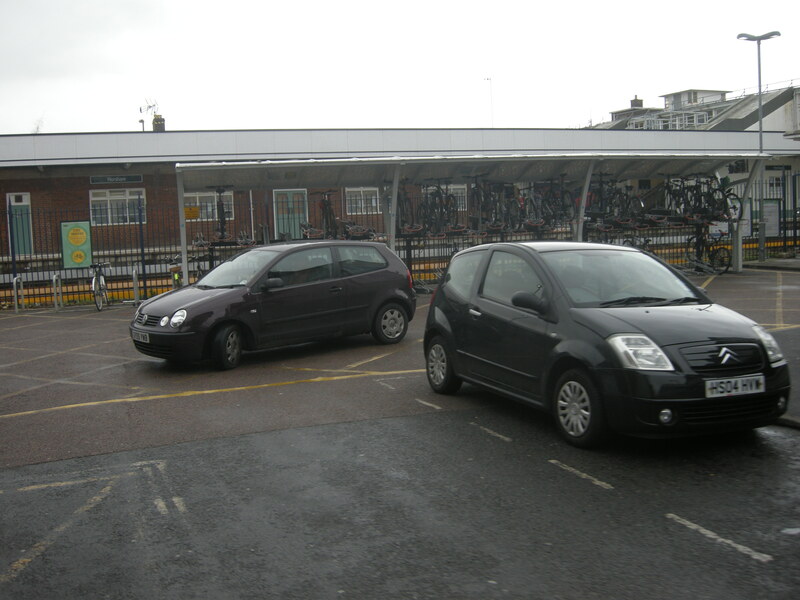 I quizzed Southern on Twitter about where this evacuation point is, and it turns out, according to Southern, that it is in this railway staff car park, to the north of the main entrance. The existing racks (the ones in short supply) are on the other side of this main entrance. So, given that the assembly point is nowhere near these racks, I don’t think it’s coherent to argue that putting more racks here would ‘compromise’ that evacuation point. Southern just need to put more racks here. It’s as simple as that. There is ample space; they can do it. There’s even space for a parking bay on the newly-created plaza in front of the station; it could take the place of the large sign telling you not to park your bike here. This issue isn’t going to go away, because come the summer the rear parking bays will be full, and people arriving at the front to find the racks full will go to the rear only to find those racks full too. As Mark Strong points out, Southern have recently received funding from government for 200 spaces at Horsham. Perhaps they could use it to put cycle parking spaces where they’re actually wanted? 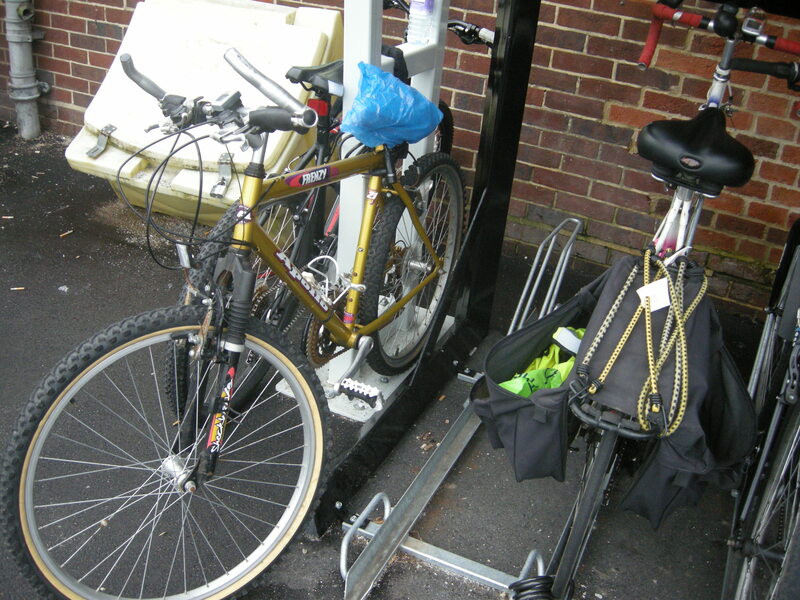 This entry was posted in Cycle Stands, Horsham, Southern Railway, West Sussex County Council. Bookmark the permalink. This post was helpful to me. I don’t know Horsham station, but the idea of pretty much leaving the station and going all that way to park a bike seems strange to say the least. If establishments but their parking bays 3-5 minutes drive away, I bet there would be a big drama! 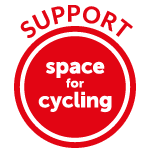 I’ve always just come to presume all the front racks are taken if I go to park my bike at the station when its the late afternoon mid week and that they’re all practically empty early on a weekend but I agree it’s a little annoying. Also out of curiosity, are the bike racks at the train station and sainsburys the only ones under shelter? Or do you know if any in town which are under cover? No, I don’t know of any others, apart from a couple tucked away in the car park under Horsham District Council’s offices! There’s a pretty dire shortage of places to lock your bike in the centre of town, full stop.